Blurring the lines between fashion and practicality, old school luxury has fused with modern technology to create a hair dryer that is perfect for style-conscious fashionistas looking to dress up their daily dose of vintage. Not only does it look fantastic, but the Bombshell Pink Retro Hair Dryer’s expert features ensure you get that perfect blow-dry every time. The added diffuser can help you exaggerate natural volume and curls whilst the concentrator is ideal for a sleek 50’s style, whether it be smooth upswept rolls, baby bangs, waves, a slick back quiff or perfectly coiled locks. Old school luxury has fused with modern technology to create a hair dryer that is perfect for retro-loving fashionistas looking to style-up their daily dose of vintage. Our Retro Dryer in Bombshell Blue is the perfect blend of retro styling and powerful, modern technology. Blurring the lines between fashion and practicality, old school luxury has fused with modern technology to create a hair dryer that is perfect for style-conscious fashionistas looking to dress up their daily dose of vintage. Classic cool meets contemporary power and consistency. In a striking, retro curve design, our 2000W hairdryer features frizz busting twin circular grilles to leave hair with a smooth, sleek finish every time. With 3 temperature settings and 2 speed settings, it allows you to style your unique hair type and style, with a cool shot feature to set your signature look. Create 50’s waves by using a round brush and the concentrator on your Retro hairdryer to smooth your hair. Once the section of hair is feeling dry, use your brush to twist the hair around in the direction you want the wave curl to go in. Gently pull the brush out leaving the section twisted and set with your favourite spray. Not only does it look fantastic, but the Bombshell Blue Retro Hair Dryer’s expert features ensure you get that perfect blow-dry every time. The added diffuser can help you exaggerate natural volume and curls whilst the concentrator is ideal for a sleek 50’s style, whether it be smooth upswept rolls, baby bangs, waves, a slick back quiff or perfectly coiled locks. 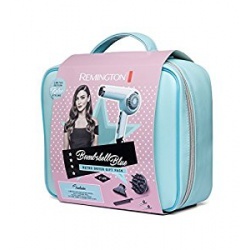 The Remington Hair Triple Gift Pack contains all the hair care products you need to create beautiful styles for any occasion. Get professional blow-dry results fast with the 2000 Watt compact Dryer. Hair will be super glossy and frizz-free thanks to the anti-static Ceramic Ionic grille. With variable heat and speed settings, you can tailor your blow-dry to your hair type. Incorporating curls into your daily hair styling has never been easier with Remington’s Instant Curls Curling Irons. Set with ceramic plates and a quick 30 second heat up, these curling irons will help you to create instant, healthy and glamorous curls in no time.